American Made. 50 Pound Capacity Fryer. Propane Ready. Stainless Tank . 1 Year warranty. Fry King Donut Fryer . Haevy Duty 3 Phase Power: 208 Volts . Works Great . Frymaster Corporation Model H14SD. Eletric Fryer . Three phase power, 208 volt. Works Great . 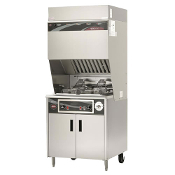 Royal RFT-50 Natural Gas Fryer . 114,000 BTU's . As new full warranty. 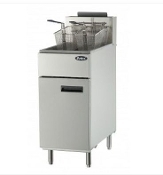 $450.00 ATOSA ATFS-40 Fryer. Forty Pound Series . Runs on liquid Propane . Great Condition. Call for shipping quote. 770-925-4858 $14000.00 Wells Electric Ventless Fryer Wells Model WELWVF886 NEW IN GRATE - SOLD WITH NO WARRANTY - AS WE ARE NOT A WELLS DISTRIBUTOR.